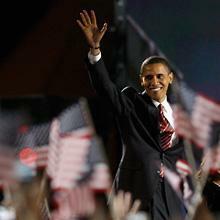 President-elect Barack Obama in Chicago&#039;s Grant Park on election night, Tuesday, Nov. 4, 2008. And not by a whisker, but by a country mile in the nation’s Electoral College vote. State by state the results came in last night. Pennsylvania, New Hampshire, Ohio, Indiana, for Obama. And then into the south and mountain west as old political barriers fell — and history was made. John McCain, at home in Phoenix, was gracious in defeat. Barack Obama, before a jubilant crowd in Chicago, was sober in victory. This hour, On Point: A remarkable moment for this country. Obama wins. We’ll unpack the voting patterns and shifts that produced his victory, and open the phones to you. Joining us from Washington is Nate Silver, founder of FiveThirtyEight.com, a polling and political analysis website. From Hanover, New Hampshire, we're joined by Jack Beatty, On Point news analyst and senior editor at The Atlantic. Joining us from Alexandria, Virginia, is Whit Ayres, Republican pollster and president of Ayres, McHenry & Associates. And from Washington, we're joined by Roger Wilkins, professor of history emeritus at George Mason University. He served as assistant attorney general in Lyndon B. Johnson's administration. He’s the past chairman of the Pulitzer Prize board and shared a Pulitzer in 1972 for Watergate coverage along with Woodward and Bernstein. He's the author of "Jefferson’s Pillow: The Founding Fathers and the Dilemma of Black Patriotism" and the autobiography "A Man's Life."